I’m not as knowledgeable as other members but first I’d ask what shrimp u are interested in keeping, easier variety would be Red Cherry Shrimp, they are a hardy variety but still need some care in keeping. Red Cherry Shrimp are fresh water, fresh water would be easier to care for also I’d think. Do u have access to rain water or reverse osmosis water? U probably could get away with filtration as long as u did water changes often, treated also with things like dechlorinator. Heater u can get away with, substrate/gravel would again depend on what shrimp u are looking to keep. I started a few years back with Red Cherry Shrimp before taking a break, they are easier to care for & still interesting to look at, admire. Plant wise, aquatic mosses, Anubias, duck weed/amazon frogbit. Personally I’d say from experience that if u are really interested in keeping shrimp u should look into a tank, like a nano tank or something larger, it’ll be easier to control water parameters which means healthier & happier shrimp. Again, I don’t know as much as others here but this it just my 2 cents worth from something that has learnt a lot from his mistakes in Shrimp keeping. Also, if interested, check out Yellow Cherry Shrimp or any of the other Neocaridina range, hardy, cheaper but also easier to care for & still interesting to look at. A bowl or something like that as the tank. - NO ! Only Opae Ula shrimp can live like that. And even that's not ideal for Opea Ula. You wouldn't want to live in a 3m x 3m room with no doors, would you? Get a nano tank with built in filtration, please. A lamp for heat/light - ok, as long as the lamp can maintain a steady 21-22deg C temperature 24 hours a day. Let my tank cycle for a couple of weeks before adding shrimp. - Or it could take a month to cycle. Please read up on how to cycle a tank. Leaving a tank, or bowl of water to sit for a few weeks does not mean it is cycled. A cycled tank means that if contains living bacteria that can convert any ammonia, in the for of waste, excrement, and excess food is converted into harmless nitrates. If a 2 week old tank is not able to do that, then it is not cycled. This is the most important step in setting up a new tank, do not skip over it lightly. Be patient. Plants, am i fine taking some from my local pond? Also, do i need a source of algae first? Like a mossball. - This is where cycling a tank helps. The few weeks of cycling will have grown some algae. Substrate, again, am i fine taking some from my local pond? Also, what kind of substrate? Gravel, dirt? - local pond stuff would be full of beneficial bacteria, which is good, but it might also come with bugs, which is not good. Use it with caution and monitoring. Apart from that, the answer is ... "it depends". 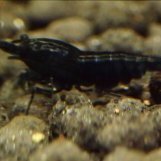 It depends on what type of shrimp (Neocaridina or Caridina), it depends on whether you want high light planted or low light mosses. Neo + low light mosses - any dirt or gravel that is inert and does not buffer. Neo + high light plants - any planting substrate or inert gravel. Caridina Low light or High light - Good quality plant substrate that will maintain a low pH. At last the shrimp, what kind? Is theyre saltwater, how does that work with the plants? - Opae Ula shrimp if you insist on a bowl. But please, don't do it. If you get a Nano tank with a filter, then start with Cherry shrimp. You can find them in Red, Blue, Yellow. If there is anything i havent talked about, some heads up is gladly welcomed :) - I suggest reading up a lot on cycling and starting a new tank before getting shrimp. Livestock, be it fish or shrimp are always the last to be added. This means getting the mandatory tools and test kits and measuring tools. Read up on the type of shrimp you want to keep, so that you can start thinking about tailoring the water parameters to that. I suggest starting on Cherry shrimp (Neocaridina) first. Someone wise once said, "We keeping water, not fish. If the water is right, everything living in it will be right too." I agree with JayC, u really are better off going with a nano tank. I wouldn’t be so keen on taking plants from a pond for an aquarium due to parasites or disease perhaps, u could buy just 1 pot of hair grass & spread it out maybe. But it’s ur tank mate so u do what u want, perhaps do a treatment of the plants from the pond? JayC would know more about that though. Done the right thing by going a tank though. Might just have to spend the money on storebought plants to limit risks. Since im going nanotank, any fish i can add to the tank making it a little bit more lively? Preferably something else than guppys or bettas? Im also considering getting like a 45 liter tank (12 gallon) instead, since i heard its easier due to it being more stable. Yeah if u can go larger do it as it’ll be easier to control parameters but u can get away with that 20l no worries. Fish, I’ve kept all sorts of fish in the past with shrimp, if the mouth is large enough to eat a shrimp or it’s young it will... so I recommend not keeping fish with shrimp from past experiences, also need to ask yourself if u want a shrimp tank or a mix of shrimp & fish. U can get away with 1 or 2 pots of hair grass, it isn’t dear & it’ll spread out like a carpet in time. It’s better to do things right other wise you’ll end up spending more in the long run mate. Hello, I'm not heaps great with computers, and though it's probably beeen asked 1000 times just wanted to know if I can delete or move a thread I've started? Just posted something in the wrong place is all.